Vietnam's Public Security Minister General Tran Dai Quang (C) stands with Communist Party's General Secretary Nguyen Phu Trong (R) and Politburo member Dinh The Huynh (L) at a closing ceremony in Hanoi, January 28, 2016. The ruling Communist Party of Vietnam will call together hundreds of members who it believes can resist corruption and rigorously review others to ease a growing problem for the Southeast Asian country’s government. At a plenum that ended Saturday, the party’s Central Committee focused heavily on personnel, including a resolution to review its members more stringently, state-controlled Viet Nam News reported. The party is due now to approve an “elite team” of 600 party members, who would in turn set “terms” for the 200-person Central Committee, another domestic media outlet said. High-profile corruption trials swept Vietnam last year as citizens were complaining about perceived acts of graft ranging from bribery at traffic stops to illegal land-use deals. The party’s self-policing would mark a new step toward reining in graft and protecting an otherwise upwardly mobile economy, analysts say. Arrests of graft suspects had dominated news in Vietnam over the past year. Last week police in Vietnam arrested two officials from a PetroVietnam subsidiary for “allegedly accepting illegal deposit interest payments from the scandal-hit OceanBank,” the domestic VnExpress International news website said. In September, a court in Hanoi sentenced the former chairman of the state-owned gas and oil firm PetroVietnam to death and gave life in prison to an official from Vietnam-based OceanBank over a multi-million-dollar graft case. 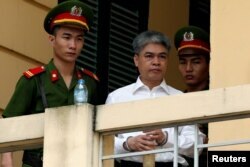 In January, 22 other officials from PetroVietnam and its affiliates went on trial. Some suspect a lot more graft under the surface. “What we see is a fraction of what’s going on,” said Dustin Daugherty, senior associate in Ho Chi Minh City with the business consultancy Dezan Shira & Associates. “These things go to trial usually and become visible for political reasons, so it’s hard to really use that. Former PetroVietnam chairman Nguyen Xuan Son is escorted by police as he leaves court after the verdict session in Hanoi, Vietnam, Sept. 29, 2017. “We don’t have much to look at in an opaque society, so we want to look at that and use it as a barometer, but I’m not sure how good of a barometer that really is,” he said. Now the party head is shaking up his members to head off more graft cases, observers say. The party controls the government, and some of its 4.4 million members run state-owned enterprises, or SOEs. Since 1986, Vietnam has grown its economy by attracting factory investments, which now drive GDP annual growth of about 6 percent. A cleaner government would help profitability of the SOEs, said Hoang Viet Phuong, head of institutional research and investment adviser at SSI Securities Services in Hanoi. Those companies make up about one-third of a $221 billion GDP. The anti-graft drive is “consistent, and it still continues, because there are still some legal issues that need to be dealt with,” she said. The plenum, which takes place twice a year, passed a resolution requiring a more objective performance review method for party officials along with measures to "control power, prevent bribery for job titles (and) fight against individualism in personnel work," Viet Nam News reported Saturday. Post-plenum news reports do not elaborate on the 600-person team's role or composition, but Viet Nam News said the party would pick a "contingent of senior officials, especially at strategic level with sufficient virtue, capacity and prestige on par with their assigned tasks." Vietnamese officials appear serious about this reform to keep public support and make business easier, said Frederick Burke, partner with the law firm Baker McKenzie in Ho Chi Minh City. “Bureaucrats are either trying to build new rent-seeking opportunities or defend existing ones, versus the reformers, including the prime minister and some of the others who are doing their best to cut some of the weeds,” Burke said. “There was such flagrant abuse at some of the state-owned companies that I think the party realized they had to clean up their act and that otherwise they’d lose public support," he said.